Tim Dahle Nissan in Murray is more than a job in the car business, it's a career. We have a proven method of growth that has helped our employees achieve the success and fulfillment they are looking for in their lives. Our company culture is all about succeeding in all that we do. We have a clear path laid out for all of our new employees whether you are starting in our parts department or you are apart of our sales department there are opportunities to advance and make a difference to our customers. 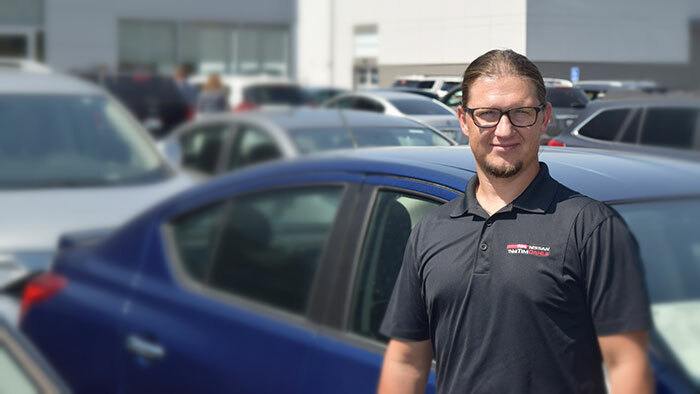 Tyler had started in the car business back in 2012 and had bounced around between a few dealerships before he came to Tim Dahle Nissan In Murray. Tyler found the dealership that he could build his career with. Tyler stated selling vehicles on the showroom floor in 2015. It wasn’t long before Tyler showed us what he could do. We invest in our salespeople with state of the art sells training and technology and Tyler took advantage of all we had to offer. Soon Tyler was promoted to the Internet Sales Department and became a Sales Executive. His ability to communicate and listen to his customers needs were skills he developed and showed proficiency with. In 2017 He was promoted to a Team Leader, there he shares his talents with a team of newer salespeople helping mentor them to achieve there goals. We are proud of Tyler and are excited to see where he takes us. His team loves working with him and he is always willing to help out with any of our customers. He has an easy going nature that is a calming influence during stressful times. Tyler Is well thought of and highly respected in our dealership.